Next at on the top of my list for our bedroom is a head board. 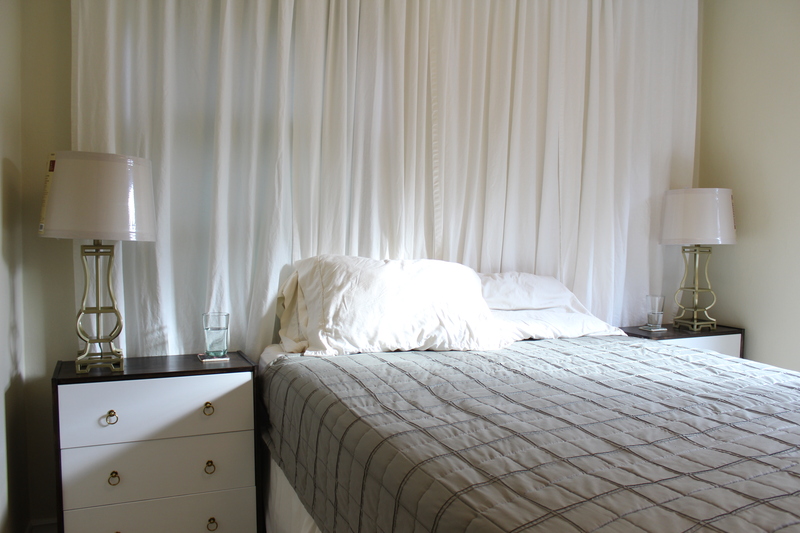 Here is the last picture I posted of our bedroom, and my last bedroom process post on the lamps, curtain, and side tables. We bought a giant piece of plywood a few years ago to serve as a beer pong table for BBQ parties. Turns out we don’t play nearly as much beer pong as we thought we were going to, and by we, I mean Jesse. It had been sitting against the wall in our garage for almost 2 years, and needed a better home. 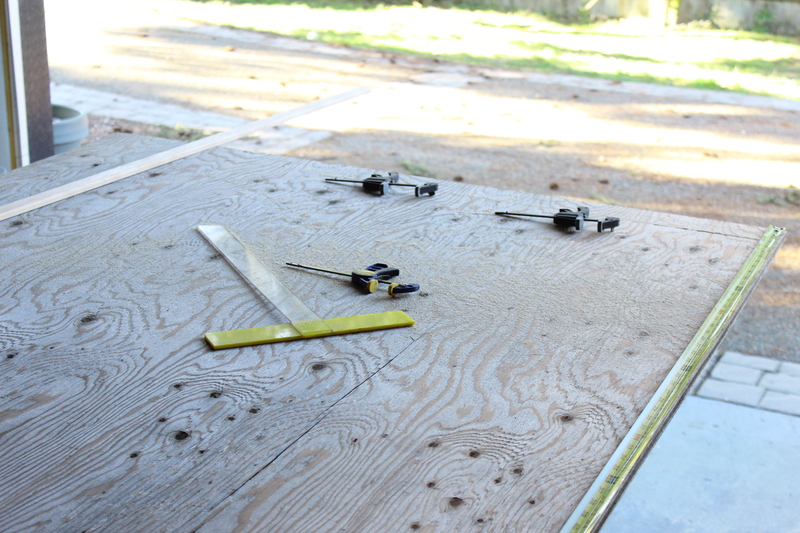 To start, I laid the plywood on some saw horses and cut it down to size. We have a queen size bed, so I went with 62″ long, and 30″ tall. As a warning, now that I am finished, if I could go back, I might have reduced it down to 25″ tall. 30″ is fine, just a little on the too tall side. 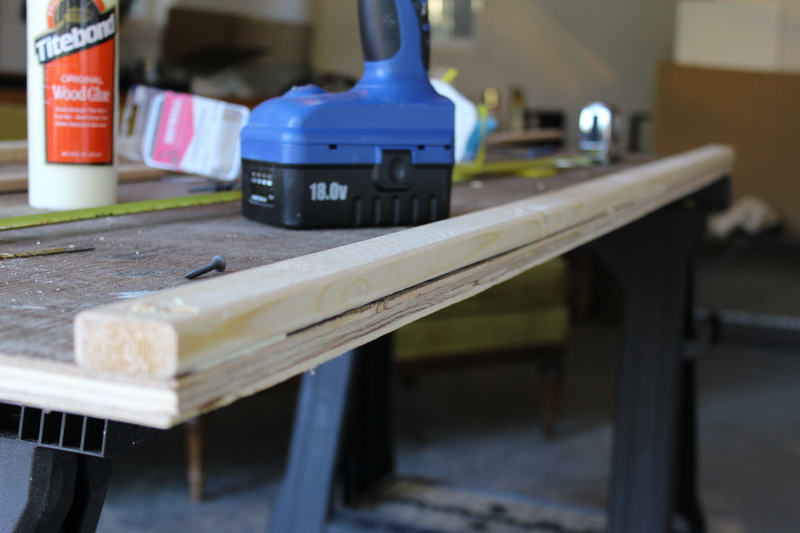 Using scrap wood clamped down as guides, I cut the wood down to size with my circular saw. 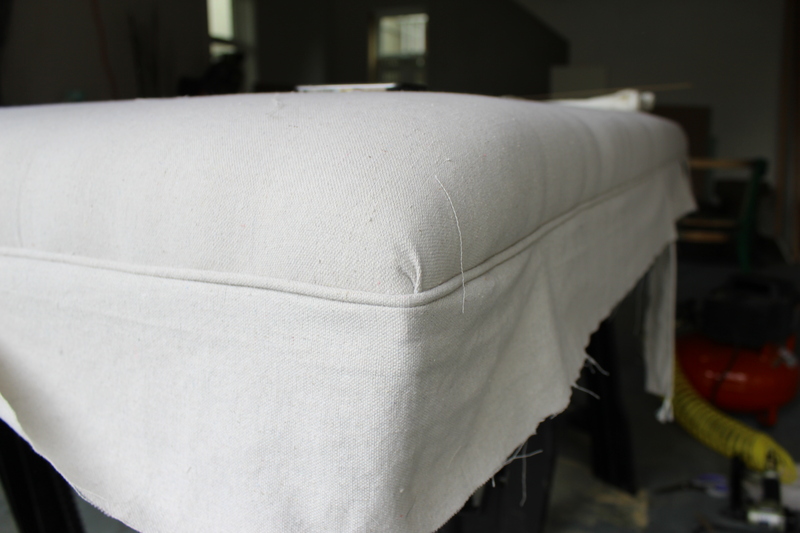 I decided on 3 tufted buttons, and measured 10 inches down from the top of the head board and then spaced the 3 out evenly across the length. At those spots I drilled holes in order to thread the buttons through. 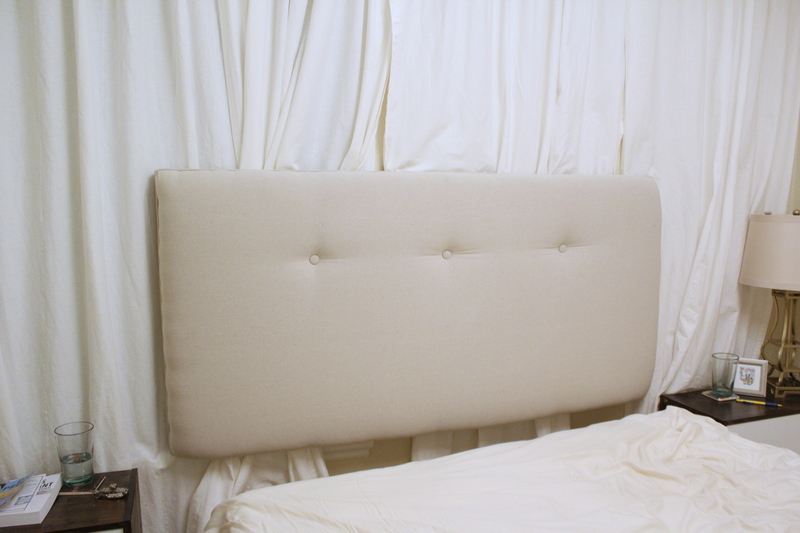 I wanted the head board to look substantial so to give the head board a little more depth than the 1/2″ plywood, I screwed 1×2″ trim pieces along the outer edges. Then I flipped it over, much cleaner! 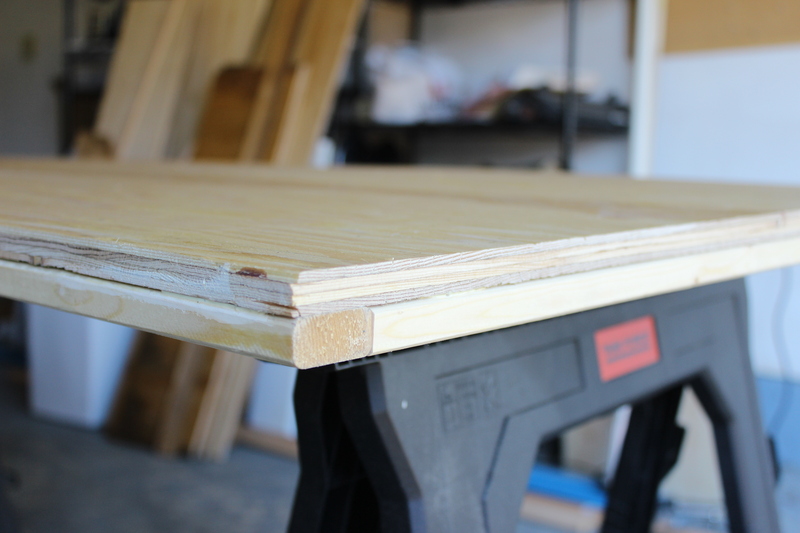 I placed my foam pad over the top and using a skill saw cut off the end in order to match it up with the board. Foam can be pretty pricey, but at Fred Meyer they sell foam pads in the camping section for under $20 which I think is a steal for such a large piece! 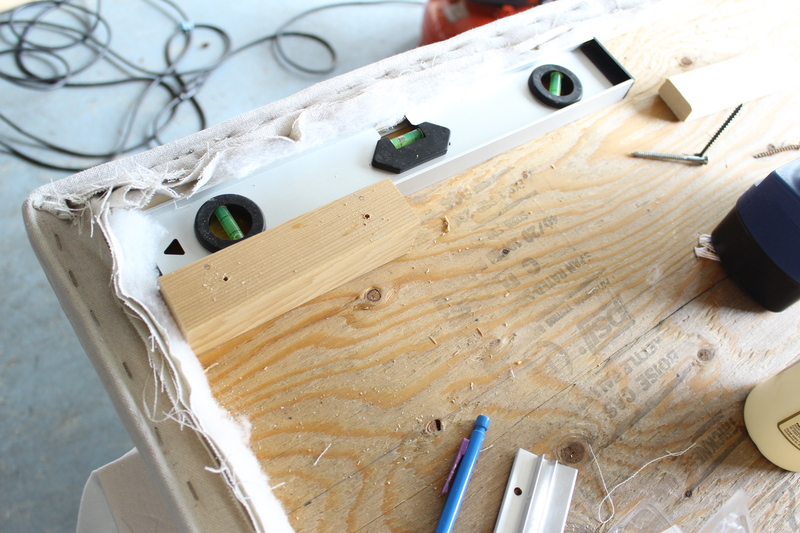 Laying the plywood on top of the foam allows you to use it as a template for finding the button holes. I just used a large sharpie and marked them through the hole. 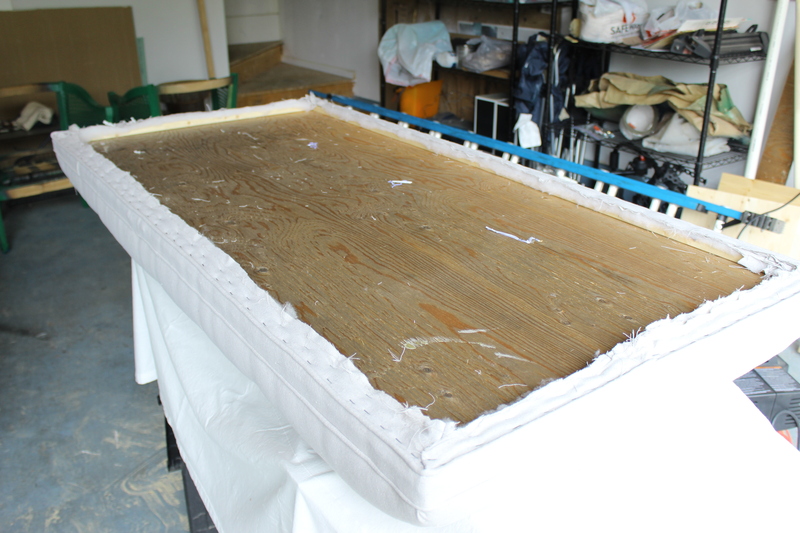 Then once the foam was marked I placed it back on top of the board and marked “X” at the spots to tuft. 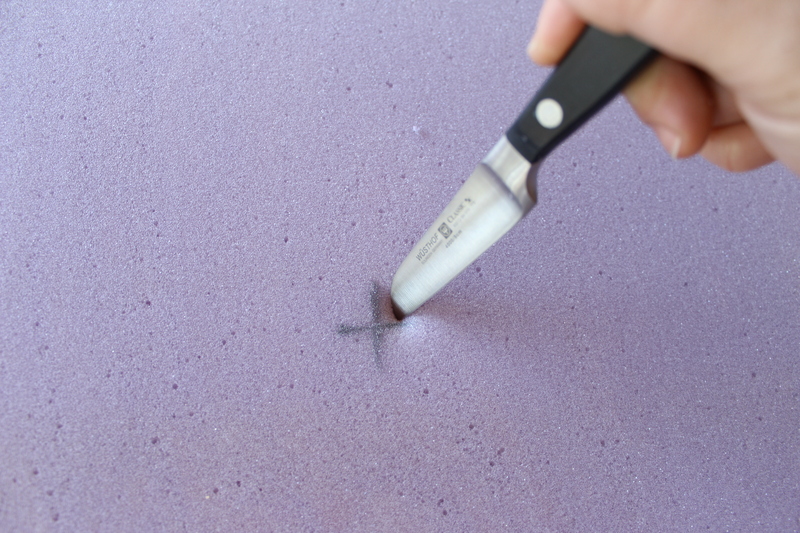 Using a paring knife I down toward the center to cut out a cone/elongated pyramid shaped piece of foam. 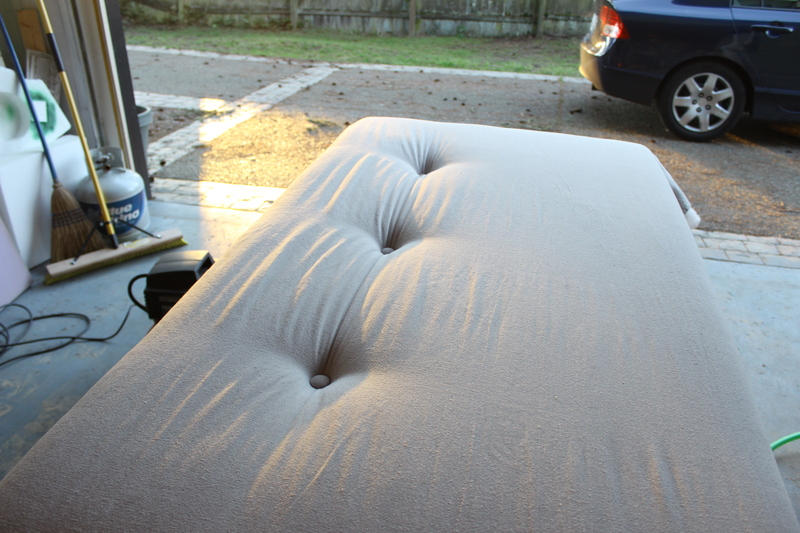 Once the incisions were made, I pulled out the foam. 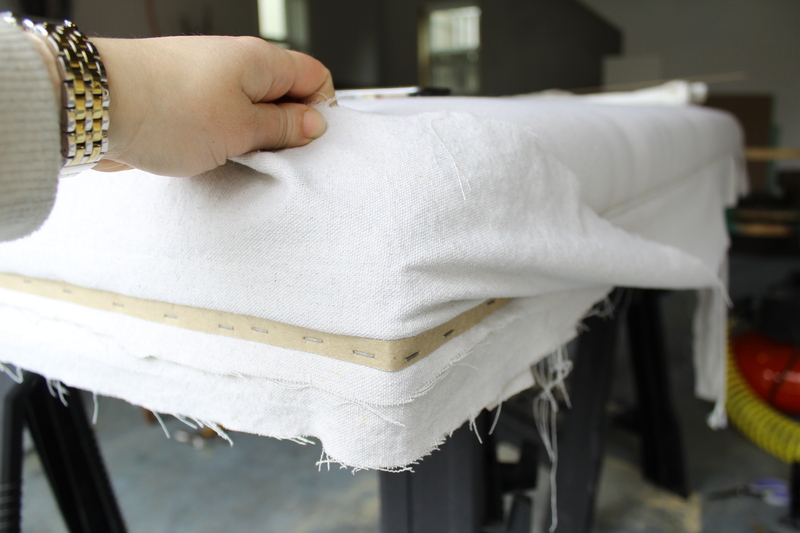 I draped the batting and the canvas over the foam together, so that when I pulled and stapled I could pull them to the same tightness. 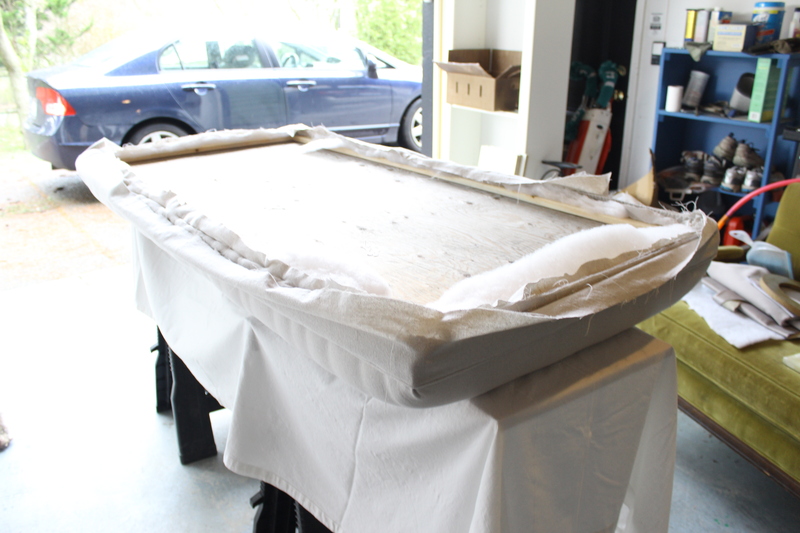 Otherwise I was nervous that the batting would fold or bunch underneath the canvas, not giving me the smooth surface I was going for. 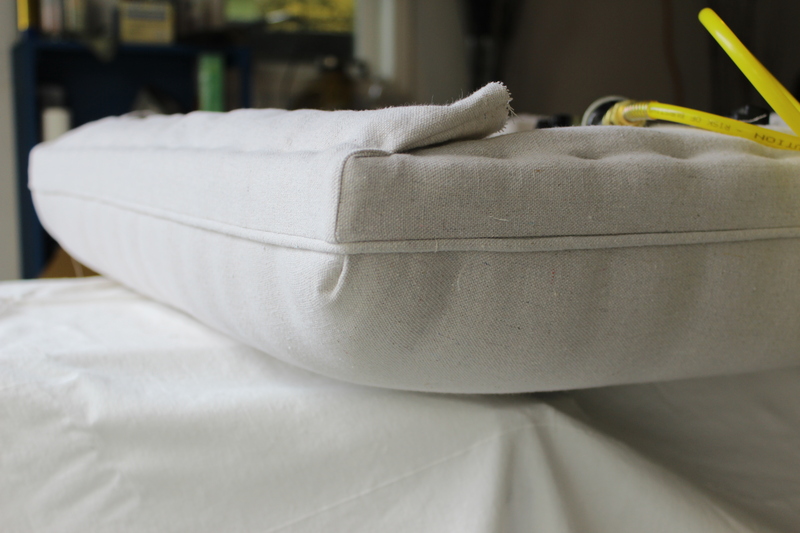 Next step was the tufting. I had buttons custom made at the fabric store down the street. I brought in (4) 4×4″ swatches (including 1 extra) and they pressed the buttons together. The painting canvas worked really nicely for this. The last time I had buttons made, the fabric was a little too thick. 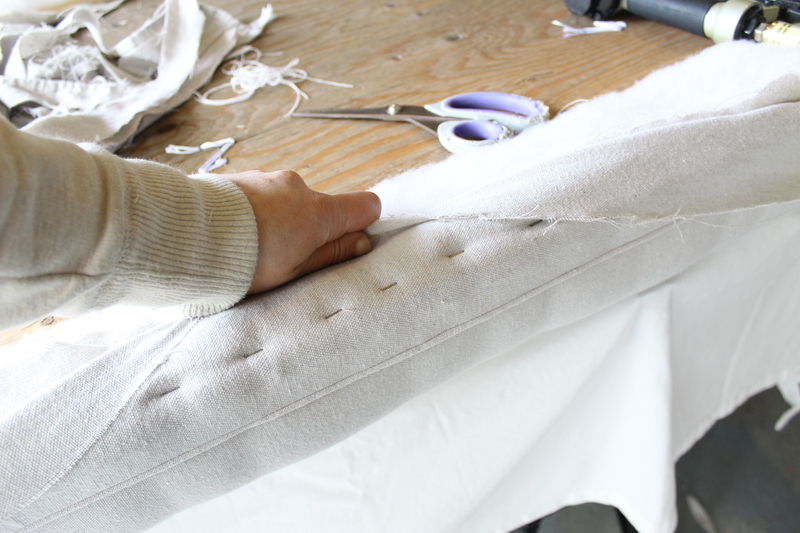 For tufting I also used a long upholstery needle and thick thread, needs to be strong enough to hold tension. 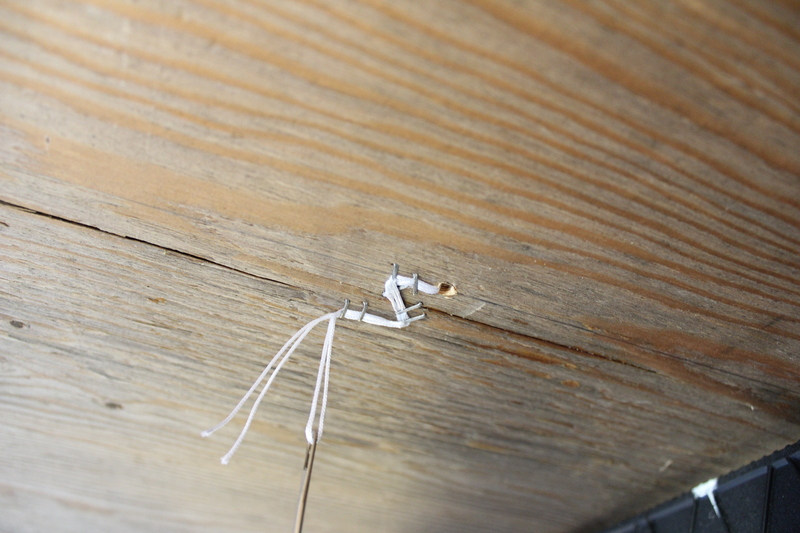 I threaded the needle up from the underneath, through the hole that I had drilled previously. 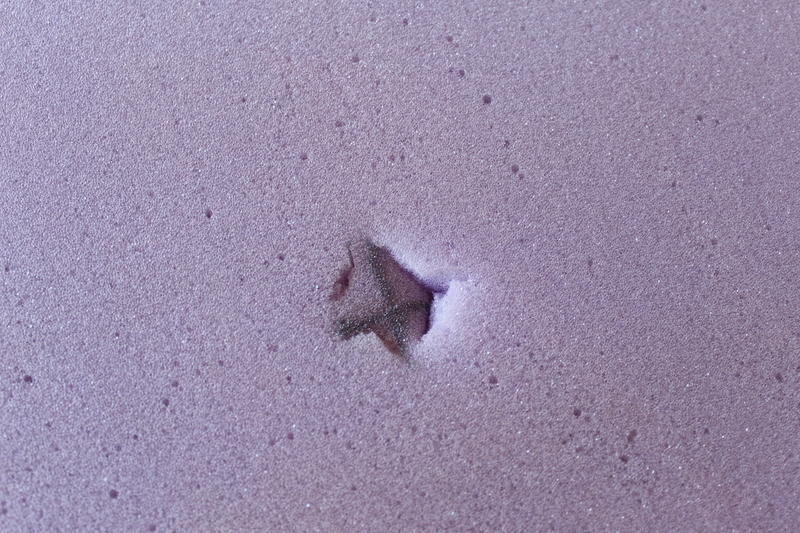 I was able to slip my hand in between the foam and the batting to made sure the needle was coming up through the center of the spot I had made in the foam. 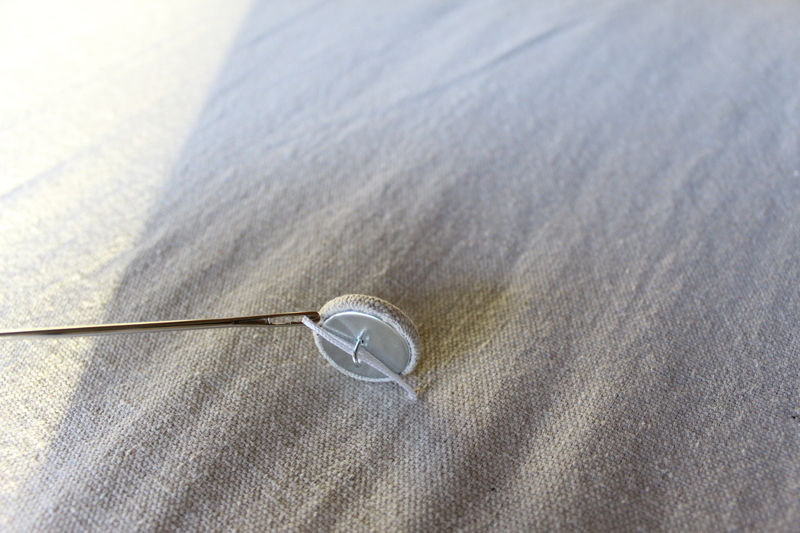 Then once it was through the fabric, I threaded the button, and send it back down. It was a little tricky to get the needle back through the hole. It helps if you can lift the foam a little, watch the needle, and guide it back through the hole. 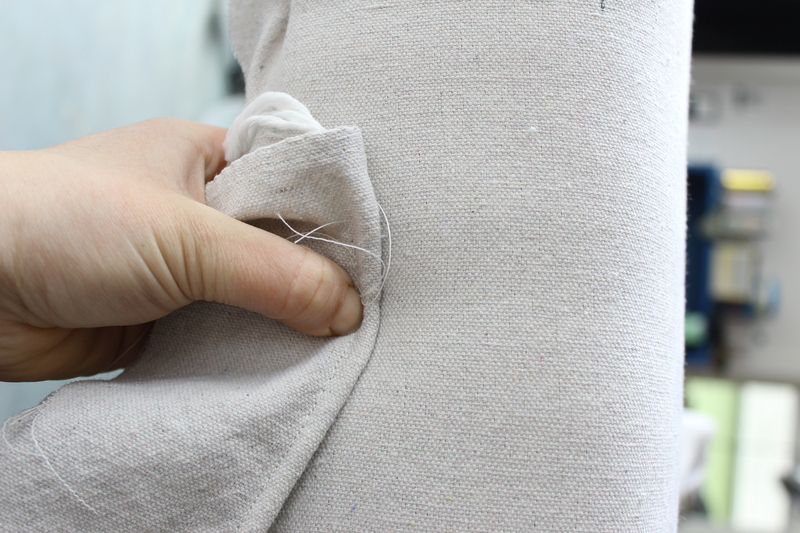 Once the needle was back through I evened out the thread, and pulled it about as hard as I could with one hand, while my other hand was pushing down the button from the top. 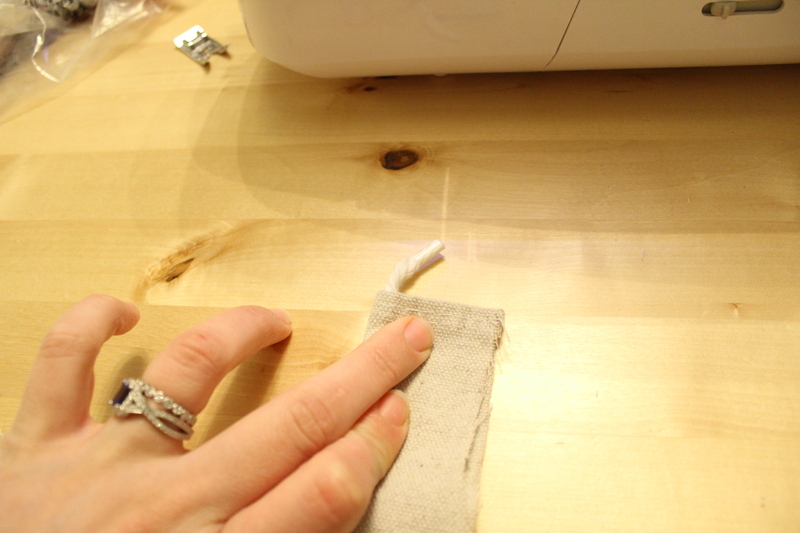 Then once I got it tight, I stapled the thread in a zig-zag pattern. 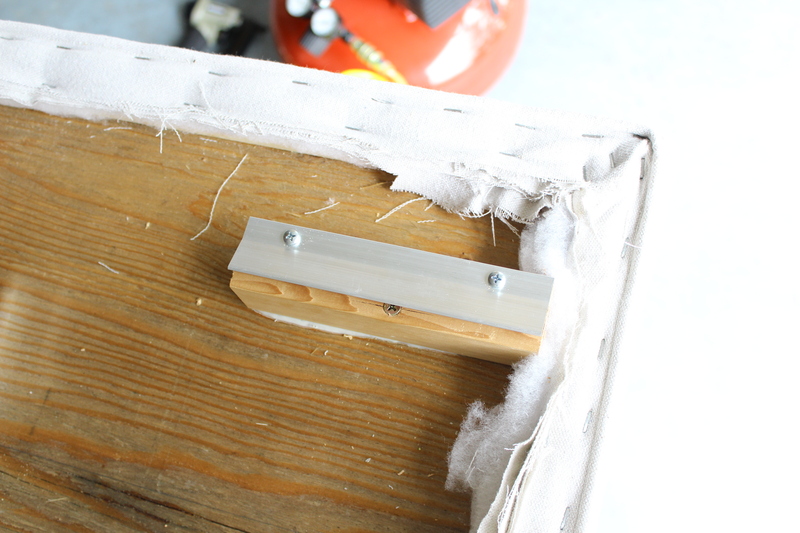 After I cut off the needle, I took a hammer to the staples to make sure they were in the plywood nice and snug. Here it is from the top with all 3 buttons done. 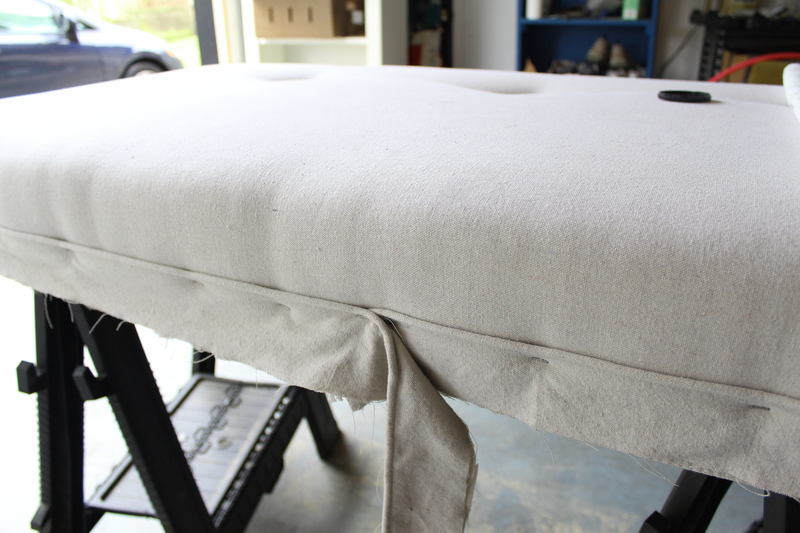 With all the buttons secure I started stapling the batting and fabric down to the underside of the board. You have to pull it pretty tight. 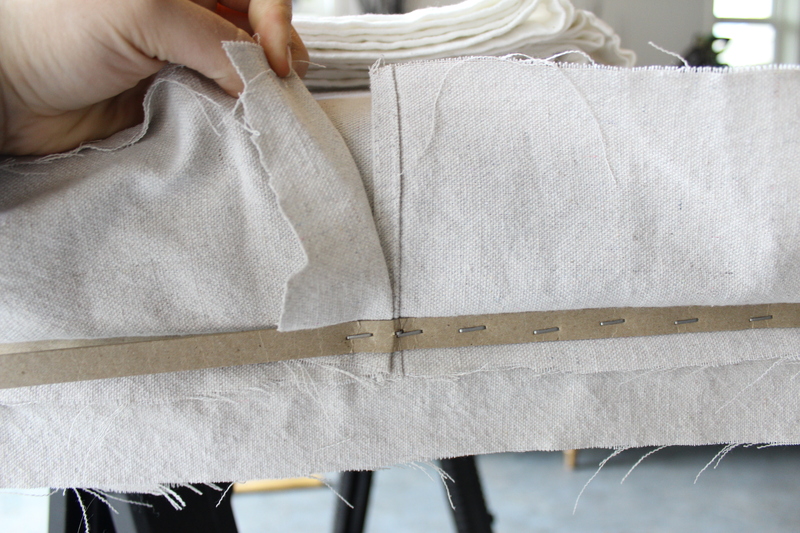 The fabric will stretch a little over time so you really want to pull it taut so it doesn’t sag later. At the corners I cut off any extra batting and folded the fabric nicely and in the same manner at each corner and secured it with a staple underneath. 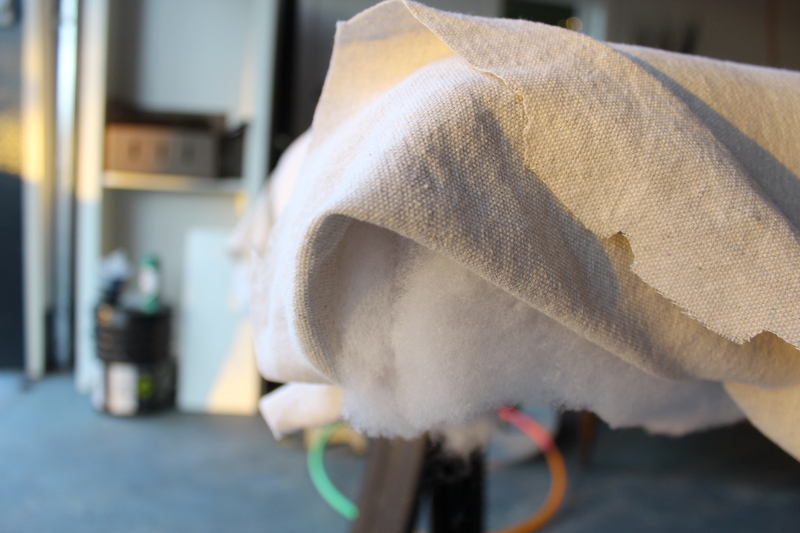 You might now be noticing that lovely hula hoop in the background amongst my other projects in process. That is from our phase when we thought we could teach our dog, Princess Leia, to jump through hoops and do various other circus tricks. Instead whenever she sees it, she runs in the opposite direction. I don’t know if it’s the blinding colors or the rattle inside. 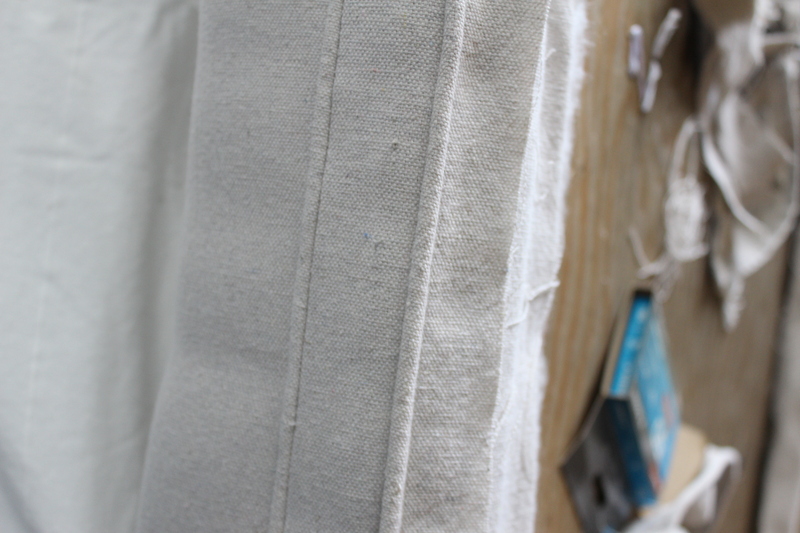 Once all edges are tightly secure, it’s time for the piping! Making piping is fairly easy, definitely worth the refined look it adds to a piece. I took long strips of the canvas. 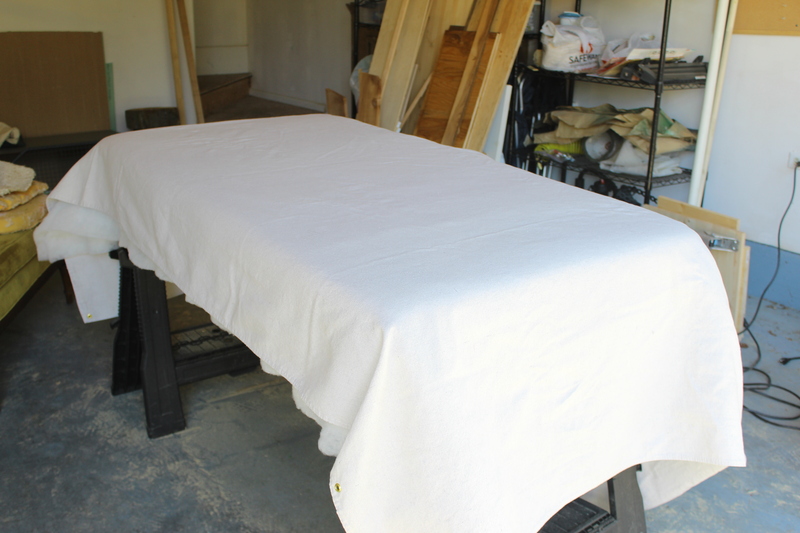 I cut it about 4″ wide, which is definitely wider than need be, but I always go for more. 2 – 2.5″ would have been totally fine. I ended up cutting off the excess once it was stapled into place. Placing the piping in the center of the strip, I folded the strip in half so the piping was snug in the fold. 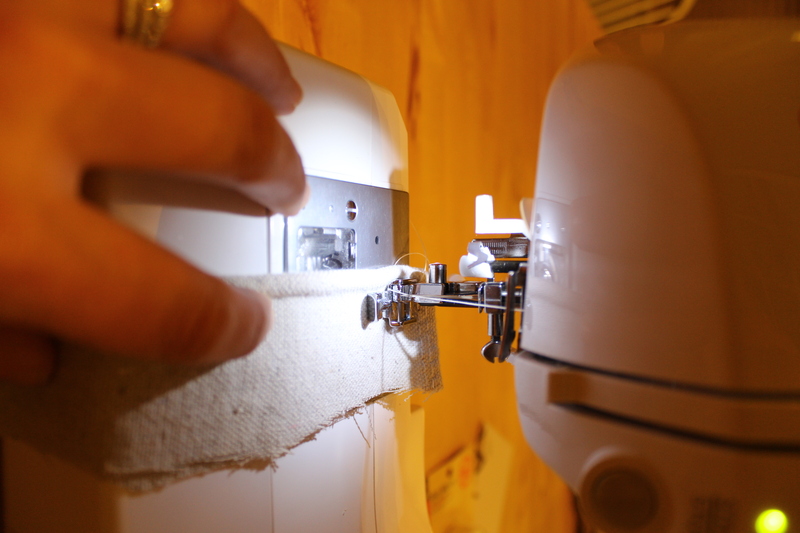 Using the zipper foot on my sewing machine I just ran it through. TIP: My trick for figuring out which foot is for zippers – it looks like a jet ski. 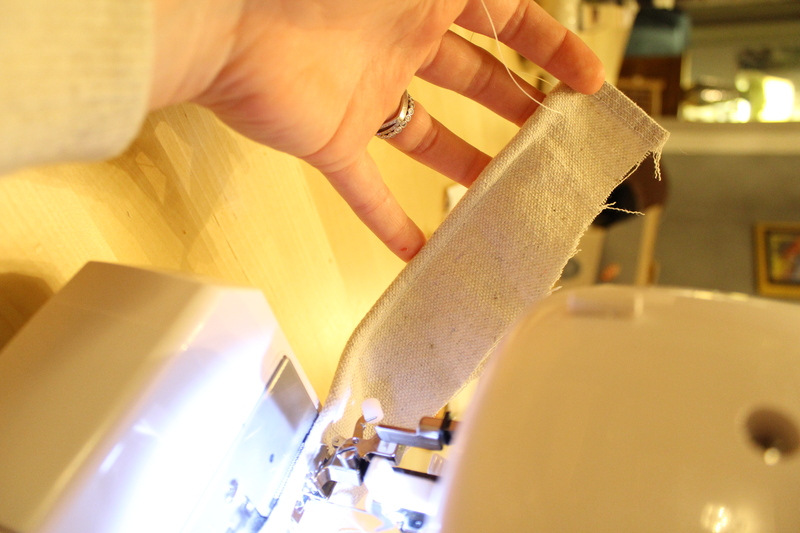 I find it helpful to guide the strip through from the opposite side of the zipper foot to help keep the line as close to the piping as possible and give it the tightest fit. I was doing this around 9pm and was hurrying to get finished to watch a TV show and I was on my last 180″ strip. I got to the end of it and noticed that the thread spool was not rotating. 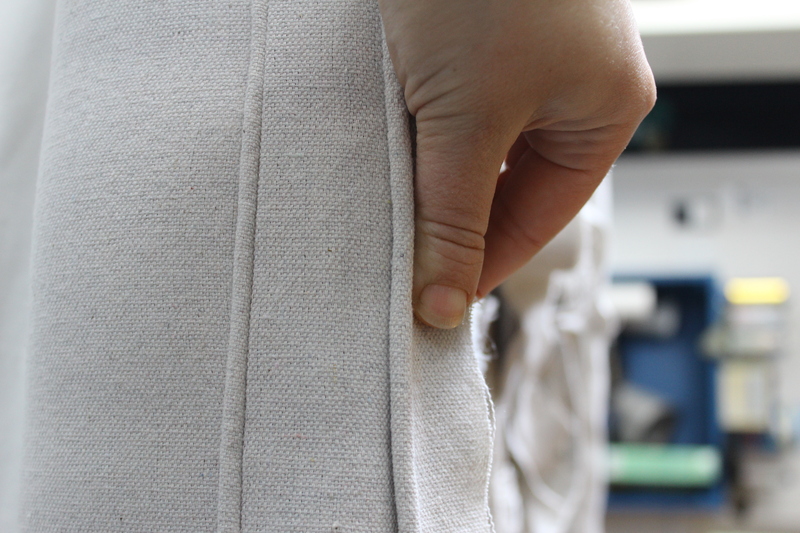 I checked my piping and at about 3 inches from the beginning something happened to the bobbin thread and nothing had actually sewn…I had to do it all over, definitely checking though about every 20″ to make sure it was going! 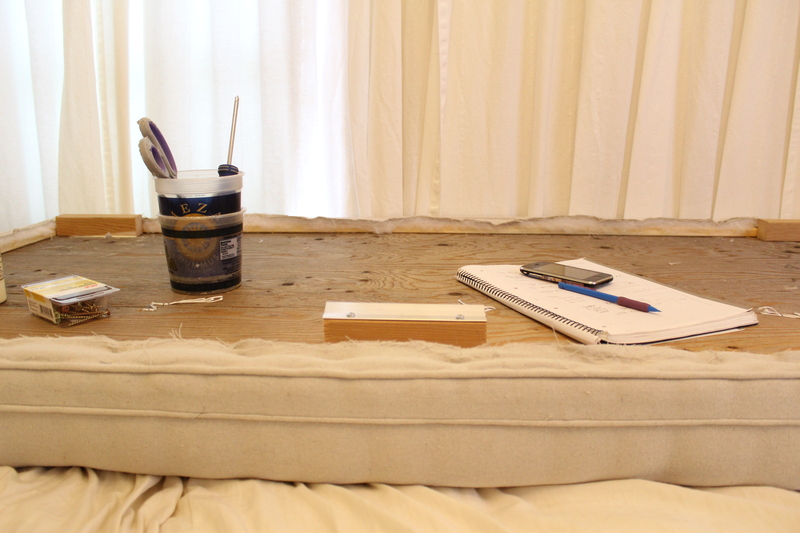 Finding the edge of the plywood with my thumb, I held the piping in place and started stapling it, keeping it straight around the head board, using the plywood edge as a guide. I only stapled about every 6-8 inches to keep it in place, since the next step would further secure it. 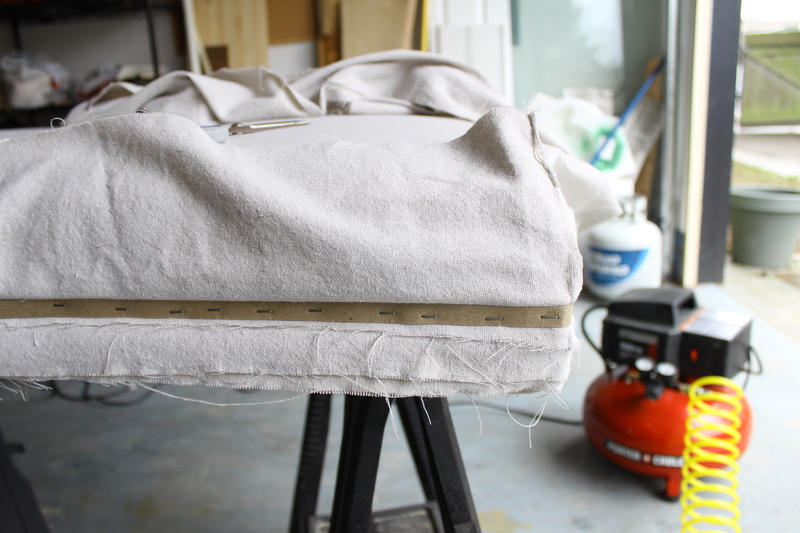 This next step is my favorite part in upholstery. It’s such a great trick that makes everything so neat and crisp. It’s almost fail proof. For this step you will need chip strips. It’s like they are as fun as they sound! 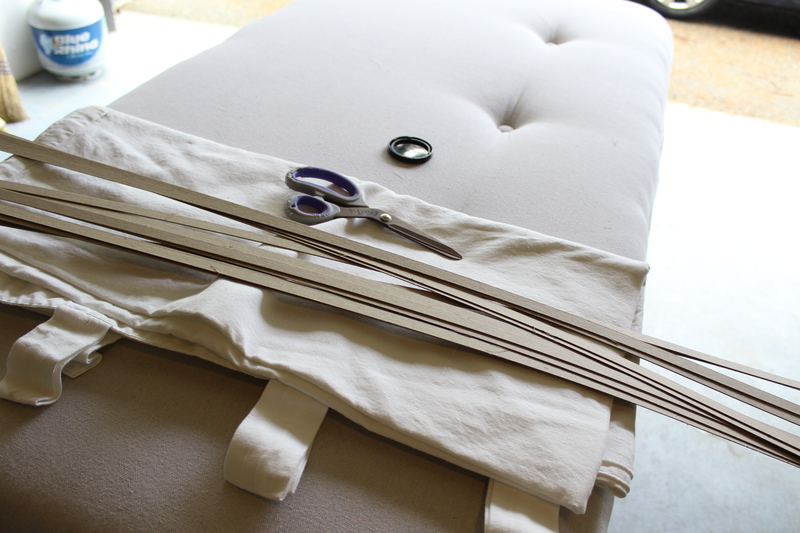 Using long strips of 4″ canvas (I had to sew 2 together to be long enough to extend all the way around) I laid it over the piping with the good side of the fabric facing the head board. Then I positioned the chip strip just underneath the piping and pushed it up a bit to ensure a tight fit against the piping and stapled into place. Here is where the end met the beginning. When you pull down the strip, it looks so nice and clean! All because of the chip strip! 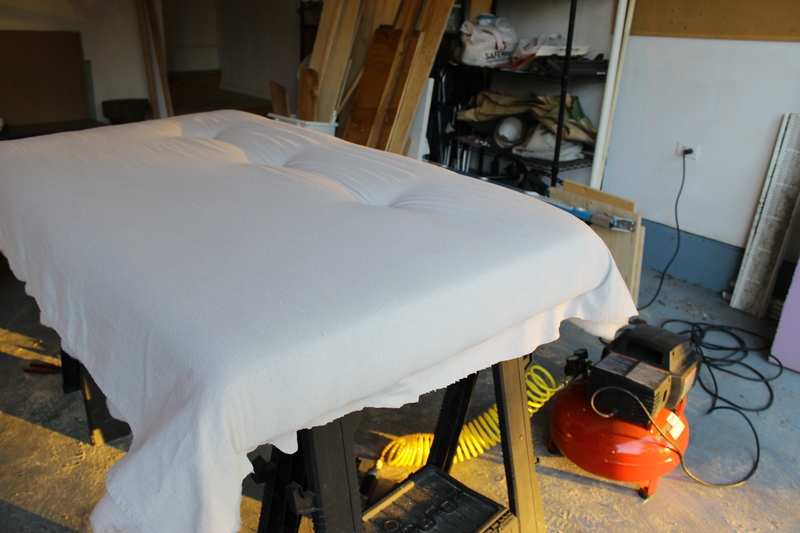 Then for the next step, I turned the head board over using a piece of scrap shelving and an old sheet to protect the head board from getting dirty. 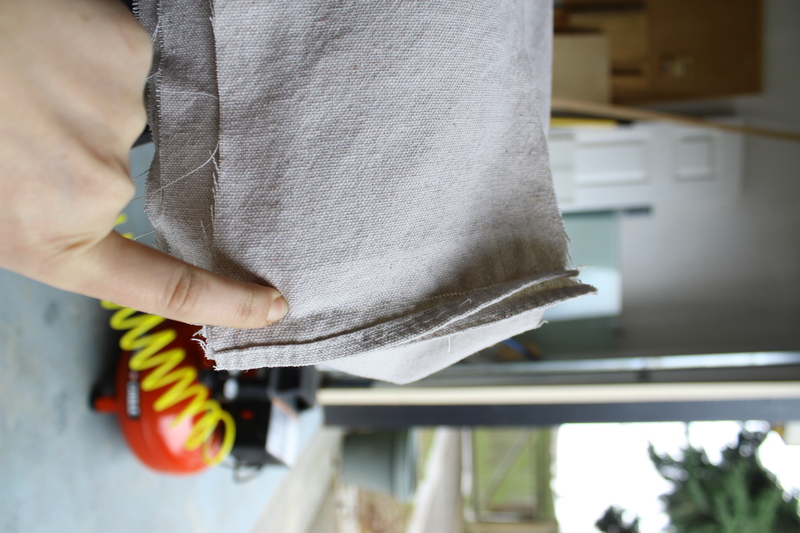 Then again I pulled the fabric tight and stapled it to the underside. 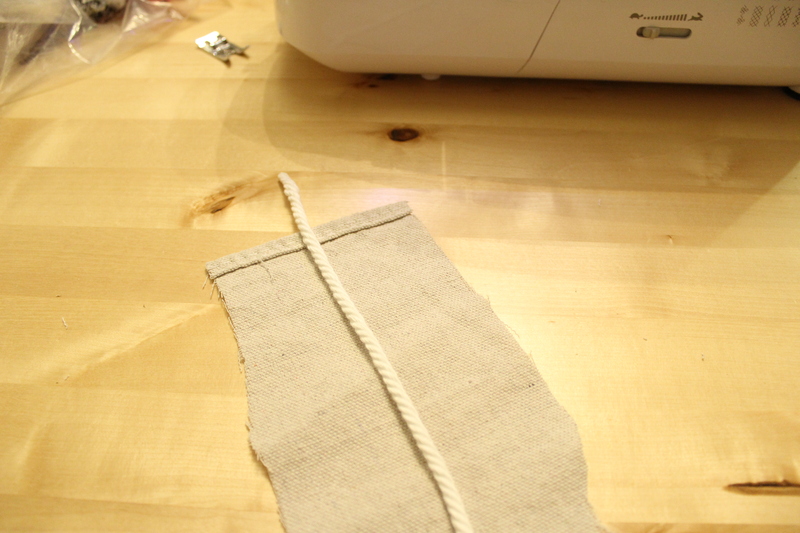 I kept the seam on the strip at the corner to help camouflage it a bit. Then it was time for my last round of piping. I stapled the piping right as close to underneath edge as I could. 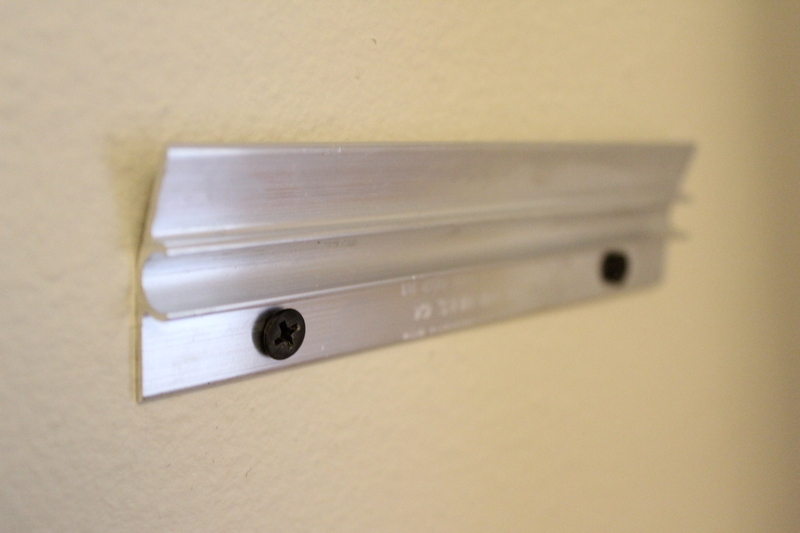 I was very liberal with my staples on the underside piping, I didn’t want there to be any visible gaps between the piping at the head board. I went along with a hammer at the end and gave them each a little tap to make sure they were in good and tight! I trimmed off the excess batting and canvas to prep it for hanging. I decided to use french cleats. 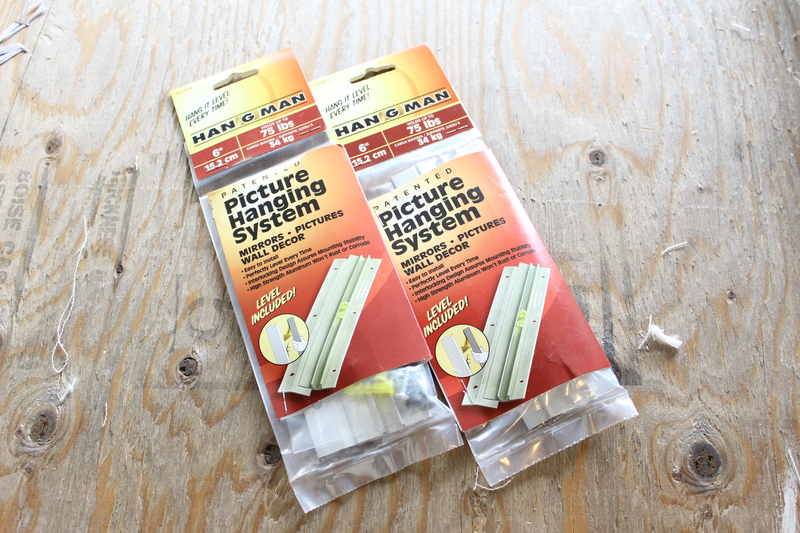 The guy at the hardware store hadn’t head that term, but they are with all the picture hanging tools. I chose to go with 2, one for each side. I used 1.5×1.5″ pieces of wood to secure one side of the cleat. 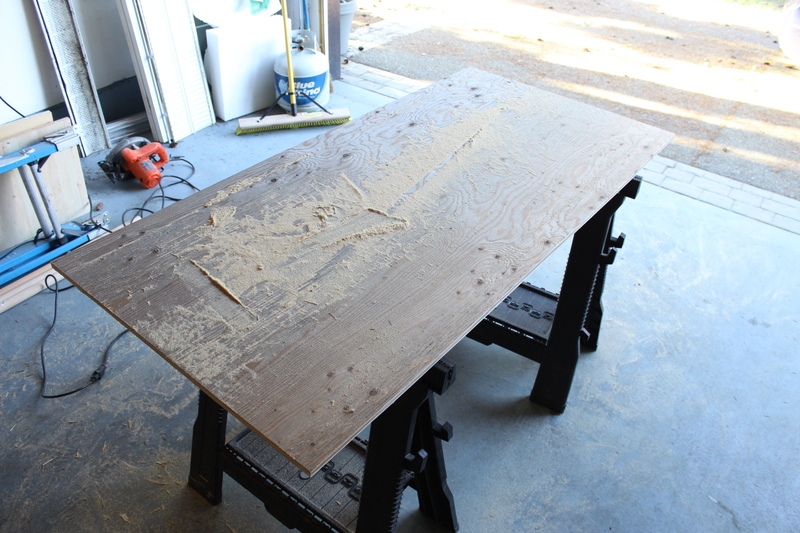 I added the wood to extend the depth a little so that the head board wasn’t directly on the wall. 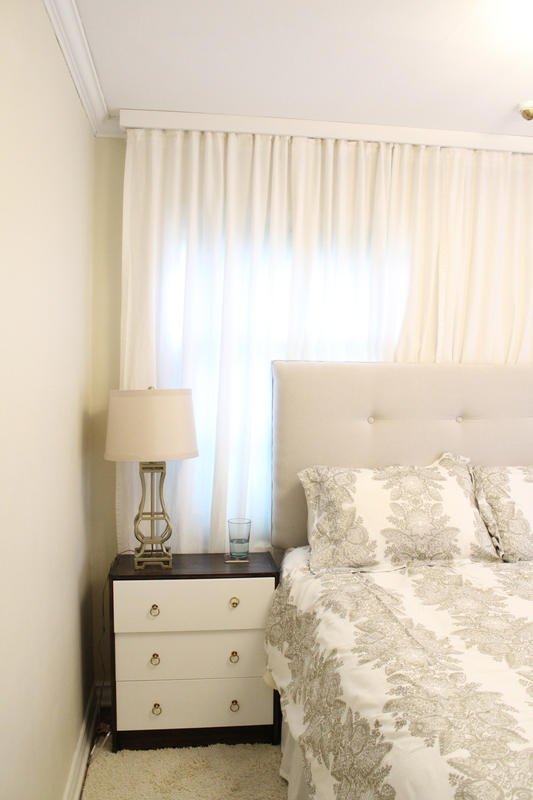 I have curtains hung behind the bed and I wanted them to fit between the head board and the wall without being totally squished. 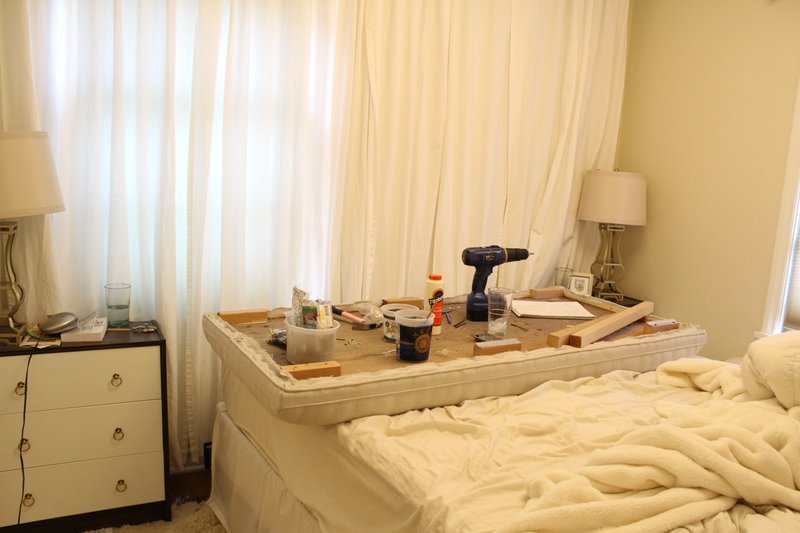 I used a leveler to make sure that both pieces of wood were secured equal distances from the top of the head board. 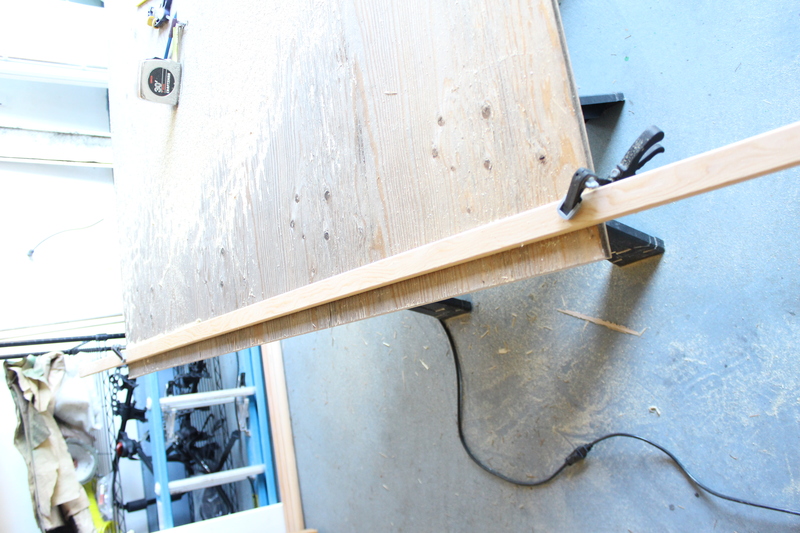 I glued and screwed the wood to the head board, and the cleat to the wood. Once that was dry, it was time to bring in the head board and secure the cleats to the wall. The reason that I hung curtains along the wall was because there is an oddly placed window on the back wall of our bedroom, and it makes it difficult to center anything. I decided the best solution was just to cover it up. 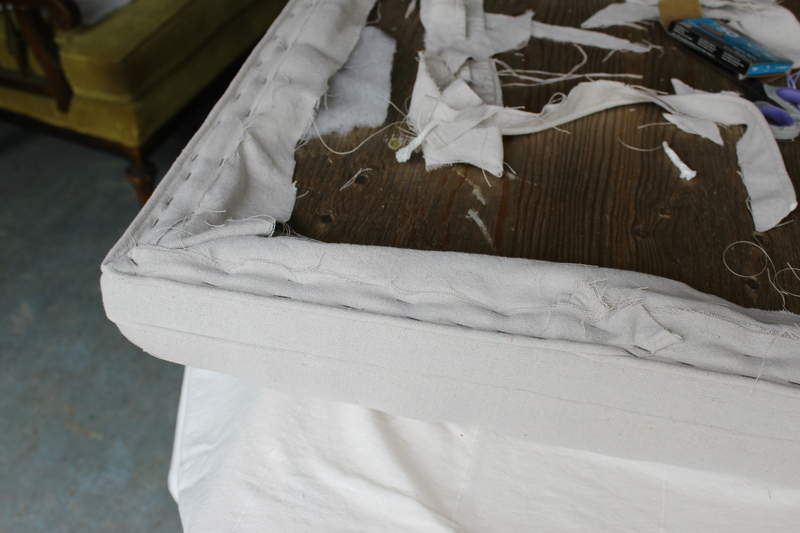 And originally when I had the head board planned out in my head, it had legs, for the simple reason that there was nothing to attach it to on the window. But somehow while working out in the garage, I decided to forgo my planned route and thought it best and more important easiest to use cleats…but you can’t attach a cleat to the window!! Duh! I could have put on legs, but I decided first to just move the cleat past the window. It would make it so that it wasn’t hung evenly or balanced, but the head board wasn’t that heavy and each cleat was for up to 75lbs, so I thought I’d give it a go. 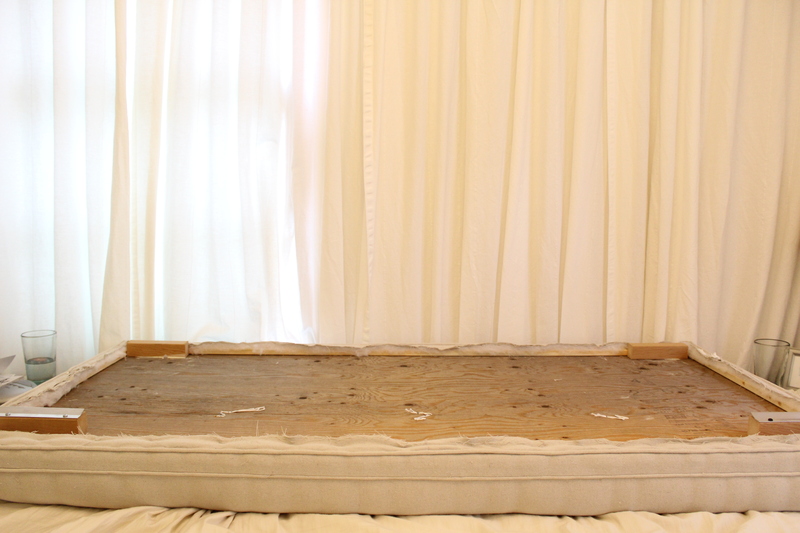 I also didn’t position the head board very high so the mattress slid underneath giving the head board a little more added support. Here is the cleat on the wall. And a photo proving that it has to get worse before it gets better! The piping details are definitely more visible from the side, but I do really like how clean the head board turned out. And you might have noticed that I really only post photos of this one wall. The other walls need work and are still on my list of things to do, so once I get them finished, I can post some photos of the whole room. 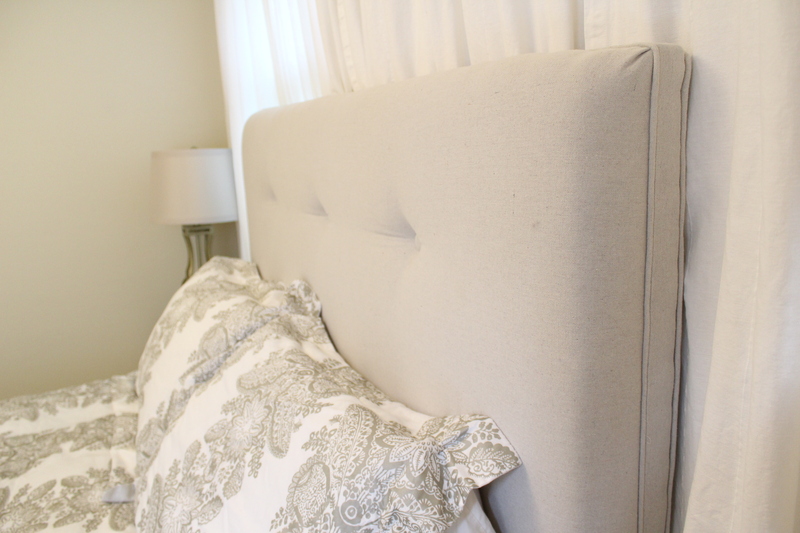 Have you seen any awesome DIY head boards? Do share!! You are amazing!!! I want to hire you to decorate our entire house, whenever it is we get one! Hey Emily! Just recently found your blog and I love it! This tutorial is great. 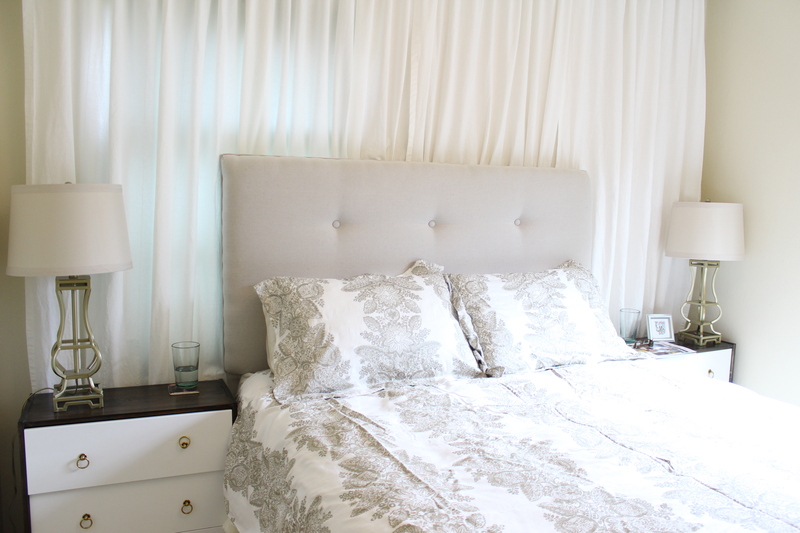 I’ve been eyeing the gorgeous linen headboards at West Elm & ZGallery, but they are still out of my budget. I’d love to attempt this but I’m gonna need to get very familiar with my sewing machine first. :) What a beautiful cozy nest you are creating! I am so proud to be able to say that my sister did this! Nice work Em!